Back pain and neck pain stemming from a herniated disc, also called bulging disc or slipped disc, is a common condition that our chiropractors treat at CARE Wellness Center. Margate Chiropractor, Dr Abraham Freeman has been treating this condition for over 25 years, and Dr Kirk Whitten has been offering chiropractic treatments for back and neck pain, shoulder pain and knee pain for over 18 years in Margate with much success. 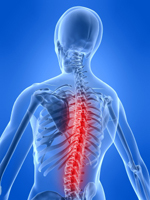 They also treat many spine conditions with Spinal Decompression. To house and protect the spinal cord. To support the hips and shoulders. To serve as an attachment to the muscles. To support the head and ribs. Your spine is made up of spinal bones, or vertebrae, each of which has a hole in its center. Each hole lines up to form a canal where the spinal cord is located and protected. Spinal nerves emerge from the cord, exit between the vertebrae through a hole formed on the side, and travel throughout your body providing essential communication between your brain and all of your body tissues (organs, muscles, bones). 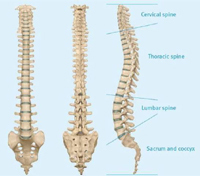 The spine consists of 24 vertebrae plus the sacrum and the coccyx. The first of the seven cervical (neck) vertebrae (C1), called the “atlas,” holds the skull, as the god Atlas held up the earth. The second vertebrae (C2), the “axis,” permits head turning and tilting. Cervical vertebrae C3 through C7 continue through the neck. The 12 thoracic (mid-back) vertebrae (T1 through T12) all connect to the ribs in back, and all but two (T11 and T12, which “float”) join the sternum (or breastbone) in front. The five lumbar (lower back) vertebrae are the biggest, thickest, and most massive. They support the weight of the entire spine, and that’s one reason why so many spinal problems, especially herniated discs, are in the lower back (lumbar) area. The sacrum is a triangular shaped bone made up of five fused vertebrae. The sacrum and the hips on either side make up the pelvis. Located where the sacrum and the hips join are the sacroiliac joints. These joints often are the source of lower back pain, leg pain or groin pain. The coccyx, from the Greek kokkyx (cuckoo) so called because it resembles the beak of the cuckoo bird, comprises four fused vertebrae, and is what’s left of the human tailbone. The cervical, thoracic, and lumbar curves give your spine strength, stability, and flexibility. The neck and lower back curves have a normal forward bend, and the mid – back curve has a normal backwards bend. In an unhealthy spine, the curves change: they can reduce, exaggerate, or even reverse causing increased wear and tear on your spine’s delicate parts! Over time you develop arthritic changes which are permanent and cannot be undone. These changes affect the way your spine functions and can create significant pain and gradually increasing disability. Viewed from the front or back, the spine appears to be more-or-less straight. The spinal column is composed of 24 vertebrae, each separated by a spongy, shock absorbing pad called an inter-vertebral disc (IVD). The disc serves two primary functions: It acts as a shock absorber to help protect the brain and spinal cord from the shock of daily activities such as walking, running, sitting, getting in/out of cars, etc. It also acts as a spacer and separates each pair of vertebrae, allowing for a hole on both sides of the spine called the inter-vertebral foramen or IVF through which a spinal nerve exits. Each disc is constructed with a jelly like core called the nucleus, and a tough fibrous outer shell called the annulus which helps to contain the gelatin inside. The disc functions as a ball bearing which allows twisting and bending movements of the trunk (upper body) in all directions. With age or trauma the fibers in the outer shell of the disc become weakened and allow the gelatin to push out where the wall of the outer shell is weakest, usually in the direction of the spinal cord or the spinal nerves. Once a disc has bulged or herniated it can create pressure on these delicate nerve structures, causing inflammation and pain. When this happens, the surrounding muscles of the spine tighten up to prevent further movement, and limit damage to the disc and nerve tissue. Very often we hear patients tell us “I didn’t do anything” or “I just bent over to tie my shoes and I couldn’t straighten up”. 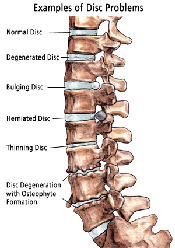 Discs can become herniated in response to trauma such as falling down stairs, lifting a heavy box, or an automobile accident, or they can become damaged from years of neglect of the spine, micro trauma repeated over long periods of time, and pressure from vertebrae which have remained misaligned and out of place causing weakening of the fibrous outer layer. If left untreated, a herniated disc may cause permanent nerve damage which will produce changes in sensation and weakening of the muscles served by that nerve. At CARE Wellness Center we have special equipment designed to treat herniated and bulging discs and a complete physical therapy and rehabilitation department to get you back on track fast. If you are suffering from any type of back and neck pain, shoulder pain, knee pain, elbow pain, or other condition, please give us a call and schedule a free consultation. Our telephone number is 954-586-8088. We want to help you get pain free and start living again! Chiropractors Kirk Whitten and Abraham Freeman proudly serve the communities of Margate, Coral Springs, Coconut Creek and Pompano Beach. Learn more about Chiropractic and Chiropractic Adjustments and start feeling better today!.